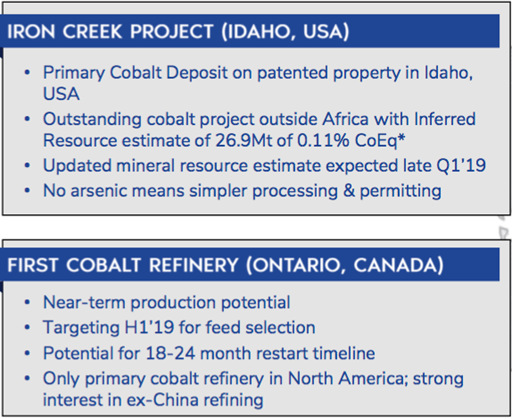 One of 2017’s blue chip cobalt juniors that I think has ample room for upside (again) this year is First Cobalt Corp. (FCC:TSX.V; FTSSF:OTCQX; FCC:ASX). The company just raised C$1.6 million. Sell-side analysts peg the stock price in a range of C$0.70 to C$1.00. Yet, the current price is C$0.145. Without going into the analyst’s methodologies, (I have not seen the reports), I can see why they’re bullish. 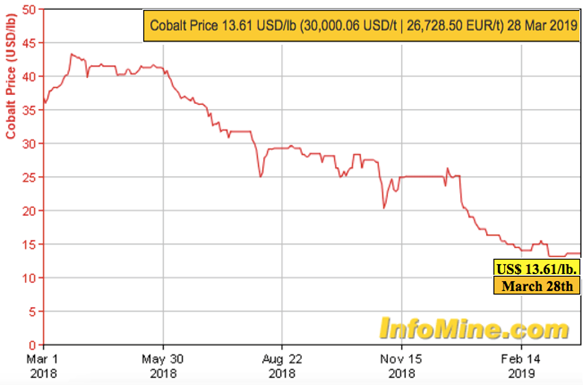 But before continuing, we need to discuss the pink elephant in the roomcobalt prices. You may have noticed that they are down quite a bit. it has NO domestic cobalt supply! Mining services firm Hatch estimated the refinery’s replacement value at US$100 million = C$133 million. That figure does not include the time value of money, the four to six years it might take to get a new refinery designed, permitted, funded, constructed and commissioned. Compare that to the company’s Enterprise Value [market cap + debt  cash] of ~C$43 million. 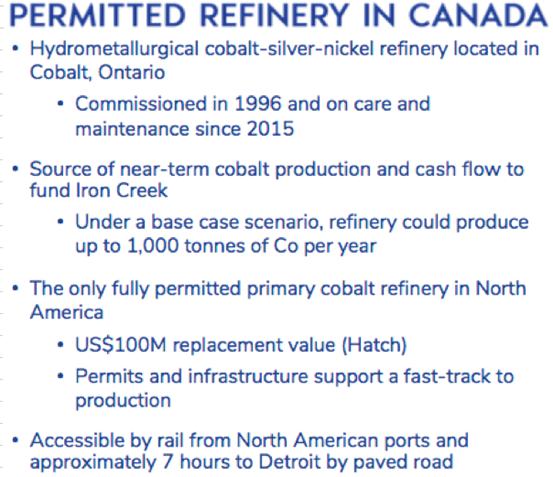 The estimated replacement value of the refinery alone is three times First Cobalt’s entire Enterprise Value! 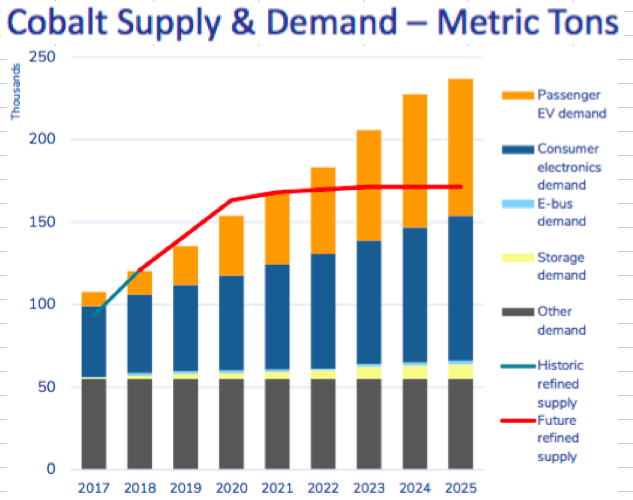 There are few options outside of China to produce cobalt sulfate for the battery market, and management says there’s no other near-term refining prospect in North America. I fear that investors are treating the estimated replacement value of the refinery like they would the Net Present Value (NPV) of a mining project. That would be a mistake. The estimated value of a hard asset is more reliable than the NPV of a project, especially if the NPV comes from a PEA or PFS. Management says the refinery can be monetized (cash flowing) in 1824 months. By definition, a NPV is the present value of future cash flows stretching out decades. this de-risking should get noticed by the market. That, and the estimated value of the refinery being three times larger than the company’s entire Enterprise Value, suggest today’s share price could be an attractive entry point. ← Why Are The Markets Ignoring The Treasury Inversion?